Prior to the Columbus Crossroads upgrade of I-670 at I-71, five single lane ramps departed within a short distance. The project amended this pattern by expanding the mainline to two lanes that now travel along the left side of the freeway. All ramps to I-71 and Ohio 3 depart from the right, as I-670 shifts to the southern leg of the two-prong freeway between U.S. 23 and Interstate 71. The northern prong serves local traffic from U.S. 23 north and the westbound mainline. Photo taken by Jasper Nijdam (04/02/08). Interstate 670 in Ohio provides a cross-town connection between Interstates 70 and 270, roughly parallel to U.S. 62. 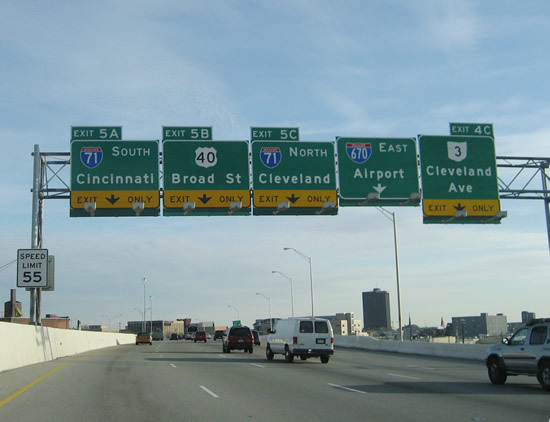 The highway comprises the northern half of the inner belt, a system of freeways including Ohio 315, I-70 and I-71. Interstate 670 provides congestion relief to the southern inner belt alignment and the Interstate 70-71 overlap. The freeway carries up to eight lanes of travel. The route of Interstate 670 was originally designated as Interstate 70N between Interstate 70 at Valleyview (Exit 96) and Interstate 70A in Downtown Columbus. I-70A formed a loop along the Columbus Innerbelt entailing Ohio 315 to the west, what is now Interstate 670 to the north, and Interstate 71 to the east. I-70N and I-70A were eliminated by AASHTO on November 10, 1973. The same actions designated I-670 from I-70 at Valleyview east to Interstate 71, northeast of Downtown. Coinciding with work on the final segments of Interstate 670, the older portion underwent extensive reconstruction. On March 30, 2002, Interstate 670 between Third Street and Neil Avenue closed for 18 months for rehabilitation and expansion. The closure coincided with new construction of Interstate 670 between Ohio 315 and Neil Avenue, an overall $75 million project. Included were aesthetic improvements such as iron fencing and decorative lighting.1 On September 19, 2003, Interstate 670 officially opened to traffic, thus completing the Ohio Interstate system.3,4 AASHTO officially approved Interstate 670 on May 14, 2004, with concurrence by the Federal Highway Administration obtained on May 24, 2004. U.S. 62 feeds directly into the exchange joining Interstates 670 and 270 west from Granville Street in Gahanna. U.S. 62 overlaps with I-670 west to Exit 7 at Bexley. I-270 travels eight miles south to I-70 and nine miles north to I-71. Photo taken by Dave Sudhoff (12/04). A wye interchange connects I-270 (Outer Belt) northbound with I-670 & U.S. 62 west ahead of the main exchange between the two freeways. Photo taken 10/15/04. Interstate 70 advances two miles east from a folded diamond interchange (Exit 94) with Wilson Road (Exit 94) to the separation with I-670. Photo taken by Chris and Amber Lokken (06/23/08). Interstate 70 eastbound expands to four lanes ahead of the wye interchange (Exit 96) with I-670 east. Photo taken by Chris and Amber Lokken (06/23/08). I-70 runs along the south side of Downtown Columbus beyond Ohio 315. I-670 travels to the north by the Arena District. Photo taken by Chris and Amber Lokken (06/23/08). Three lanes partition from the left side of I-70 east for Interstate 670 toward John Glenn Columbus International Airport (CMH) and the Columbus Beltway (I-270) at Gahanna. Photo taken by Chris and Amber Lokken (06/23/08). Interstate 670 Project Information. http://www.dot.state.oh.us/I-670/default.asp Ohio Department of Transportation (ODOT), web site. Ohio Interstate Highway System Historical Timeline. http://www.dot.state.oh.us/interstate50/OhioInterstateHistoryTimeline.htm Ohio Department of Transportation (ODOT), web page. I-70 I-71 Project 1, ODOT I-71/670 Project Website accessed May 29, 2015.